Sebastian Giovinco notched more milestones, Sigi Schmid returned to the sideline and Atlanta said farewell to its temporary home in entertaining fashion in MLS Week 21. This MLS weekend was supposed to be all about the returns. Dom Dwyer, fresh off a blockbuster trade from Sporting Kansas City, returned to the city where he started his run as a consistent goal-scorer. On the other coast, Sigi Schmid made his return as coach of the LA Galaxy after the club fired Curt Onalfo (and minutes before future rival LAFC announced the hiring of Bob Bradley). As it turned out, most of the action took place away from those two games. Schmid's Galaxy endured a 0–0 draw against his former team, the Seattle Sounders, while Dwyer started but didn't see too much action in a 1–1 draw. Elsewhere, though, there were four (four!) 4–0 games, two (two!) bicycle kicks, and a whole lot of other highlights worth mentioning, including some provided by the league's showpiece talent. ​Sebastian Giovinco and Andrea Pirlo may be on opposite sides now, but the pair have a long history as teammates. The two Italians played together at Juventus for four years, before both left in 2015 to join their respective teams in MLS. They've also shared many games with the Italian national team. None of that, apparently, matters much on the field when the two are playing against one another (Nor should it). Giovinco gave Pirlo a couple things to think about en route to a two-goal, one-assist game on Sunday, as Toronto FC rolled over NYCFC& 4–0. 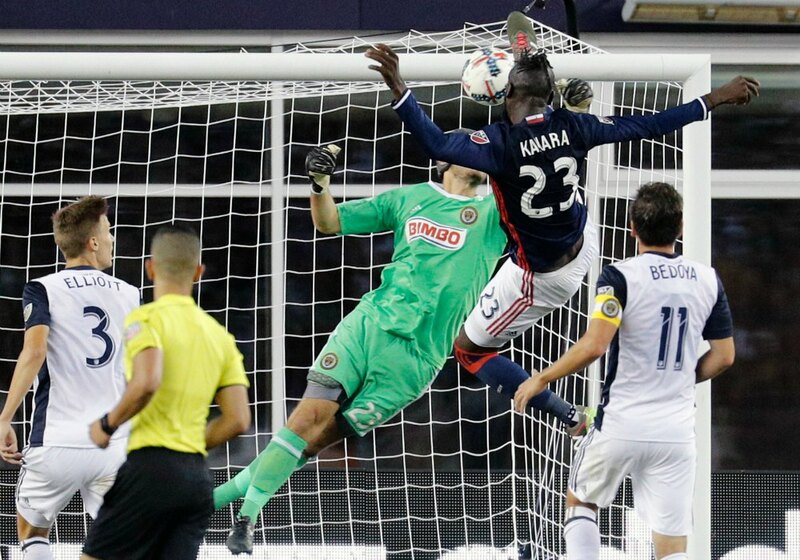 Kei Kamara is already well-known as one of the most athletic strikers in MLS. But even by those standards, the goal he scored to open up a 3–0 New England Revolution win over the Philadelphia Union is flat-out ridiculous. Maybe it was the socks. Atlanta United hosted its last match at Bobby Dodd Stadium before moving two miles away to the brand new, ultra-modern Mercedes-Benz Stadium. As far as temporary venues go, Bobby Dodd can fairly be counted as one of the best in league history, and the venue got a peach of a sendoff with two fantastic goals in its finale as Atlanta United took on Orlando City in the latest edition of a budding rivalry. It wasn't a win, but it was certainly a high note to go out on. We'll miss you, Bobby Dodd. Minnesota United made one particular SI soccer writer eat a bit of crow by winning their sixth game of the season...and what a win it was. The Loons powered by D.C. United with a 4–0 win, which included goals from Christian Ramirez, Abu Danladi and Miguel Ibarra. Austrian winger Daniel Royer played his first game for the Red Bulls on August 7, 2016. In his first 23 games from that point, Royer scored five goals. Then, somebody must have flipped a switch or something. Royer has six goals in his last four games for New York, including two in Saturday's 4–0 win against Montreal. His first came via PK, but his second had the look of a player sky-high on confidence. It's been a good weekend for amazing own goals, with Inter Milan's Geoffrey Kondogbia scoring one from 40 yards away in the International Champions Cup. Matt Besler's own goal on his return to the Sporting KC lineup after winning the Gold Cup with the United States isn't quite that caliber, but it is nothing if not a truly impressive strike. To Besler's credit, he turned his own goal into a positive. Juan David Cabezas scored his first goal for the Houston Dynamo in the team's 2–2 draw with Portland on Saturday. What part of his body did he use? Ola Kamara scored both of Columbus Crew SC's goals against Real Salt Lake in a 2–2 draw on Saturday, but I'm not going to show either of those goals. That was the only goal of the game.